September is a few days away so that means that Fathers Day is just around the corner. 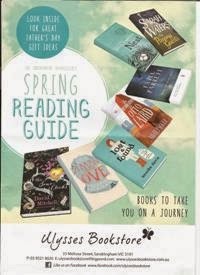 Why not check out our new Spring Reading Guide for lots of good ideas. If you haven't received one in your letterbox then drop into the store to pick up a printed copy or if you don't mind reading a digital copy then click on the cover picture below.